This indispensable course text and practitioner resource, now fully revised, has helped tens of thousands of readers implement evidence-based interventions to improve students' academic achievement and behavior in PreK–12. The volume presents best-practice guidelines and step-by-step procedures for 83 interventions that can easily be implemented by teachers and other school-based professionals. It is a go-to book for those working in a multi-tiered systems of support (MTSS) or response-to-intervention (RTI) framework. User-friendly features include recommended print and online resources and 10 reproducible forms. Purchasers get access to a Web page where they can download and print the reproducible materials in a convenient 8 1/2" x 11" size. *Updated throughout to reflect current research-based best practices. 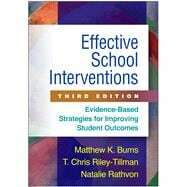 *Chapter on important skills for intervention success. *The intensity of each intervention (classwide, small-group, and/or individual) is now specified. *Behavior chapter has been reorganized for easier use. Matthew K. Burns, PhD, is Associate Dean for Research and Professor of School Psychology in the College of Education at the University of Missouri/n-/Columbia. He is a past Editor of School Psychology Review and Assessment for Effective Intervention. His research focuses on the use of assessment data to determine individual or small-group interventions. Dr. Burns served on the faculty of the University of Minnesota for 10 years and Central Michigan University for 5 years. He has published over 150 articles, book chapters, and books, most related to response to intervention, academic interventions, and facilitating problem-solving teams. T. Chris Riley-Tillman, PhD, is Professor and Department Chair in the Department of Educational, School, and Counseling Psychology at the University of Missouri/n-/Columbia. He is an Associate Editor of School Psychology Quarterly and Assessment for Effective Intervention. His research interests include the development and validation of assessment and intervention methodologies, single-case design, and consultation. The author of over 100 articles, book chapters, and books, Dr. Riley-Tillman is a member of the Society for the Study of School Psychology and a Fellow of the American Psychological Association. He is the Series Editor of The Guilford Practical Intervention in the Schools Series. Natalie Rathvon, PhD, now retired, was Assistant Clinical Professor of Psychology at The George Washington University, where she supervised graduate students in school-based placements. A former teacher, guidance director, counselor educator, and psychologist in private practice, she has provided consultation and professional development to schools and agencies in assessment and accountability, reading, problem-solving teams, and school interventions. Dr. Rathvon has published several books for professionals and parents.